Awarded a HotelsCombined ‘Recognition of Excellence’ certificate! 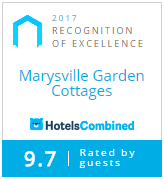 We are thrilled to share the news that in April 2017, Marysville Garden Cottages was awarded a HotelsCombined ‘Recognition of Excellence’ certificate for 2017! This award is in recognition for consistently achieving the highest standards of customer satisfaction worldwide. The team at HotelsCombined undertook the largest analysis of customer opinions online of over 800,000 hotels worldwide. We received an incredible score of 9.7 out of a possible 10, and are excited to be now representing the top 3% of accommodation worldwide for customer satisfaction. On Friday, 18th September 2015, we were thrilled to be announced as the Winners of the Housing Industry of Australia Award for Best "Small Commercial Project" in Eastern Regional Victoria. Back on the 12th Oct 2011, Anthony and Tracy purchased a block of land in the main street of Marysville. One year later they started building 8 cottages which they designed and furnished. They really wanted to build in a style that suited the little alpine village of Marysville. It took them, and a team of tradesmen, 12 hard working months of commitment and long days until it was open for business. Anxiously waiting for their first booking, wondering if building the cottages was a good idea, a booking finally appeared, then over time, we gradually gained interest, through word of mouth and electronic means of communication. Anthony & Tracy of Marysville Garden Cottages will always continually appreciate your support and the way they see their guests enjoy what they have created. To receive such an esteemed recognition from Australia's largest residential building organisation was truly heartwarming.